Places are now open for our biggest event of the year! Sign your school up to take on the challenge! 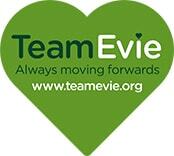 Welcome to the home of TeamEvie, a charity set up in memory of our beautiful, incredible Evie Johnston! Our mission is to help sick children and their families who face similar challenges to those Evie faced in her all too short life. This mission is achieved by supporting 10 different wards and medical teams across the North East and Cumbria by raising vital funds to buy physiotherapy equipment, sensory equipment, comfort items, portable libraries, TVs, iPads for patients and staff training, Christmas and Easter hampers, breaks away for bereaved families and much, much more… thank you for visiting our site to find out more about what we do!